YOWZAlicious: No More Office Clutter! A huge source of stress and anxiety for many people is clutter... specifically, paper clutter. The good news is: there's a CURE! Technology has reached the point where it is accessible to people of more varying income levels than ever. So, use technology to your advantage. You don't even have to be a computer whiz... if you can make copies and use Google, then you can clear the clutter from your office. Your first task is to get rid of the majority of your User Guides / Instruction Manuals. This is the most important step: schedule 1 hour when you can work on this project, completely undisturbed. Put it in your calendar - it will help keep you accountable to yourself. Gather every User Guide from around your entire home. If you have a laptop, you can work in front of the tv (to relieve the monotony); or blast some tunes. With your User Guides in front of you, open your internet browser and go to Google. In the search box, type: "user guide, manual pdf, [name of product], [model #]". The model # isn't usually necessary, but it can be helpful with more generically named products. "user guide, manual pdf, EPSON WorkForce 630"
"user guide, manual pdf, Hamilton Beach Blender, 58142R"
Once you've located the User Guide online, you can download the PDF to your computer. I recommend creating a folder on your desktop called "User Guides" or "Manuals" in which to save all of your PDFs. Save the PDF using the name of the product (and Model #, if available). In about 5% of cases, you won't be able to find the User Guide online. In those cases, you can either keep the hard-copy version...or you can assess whether or not you'll ever actually need to reference it; if not, then toss it. If you decide to keep it, however, be sure to place it in a separate pile from the ones you're getting rid of. Also, make sure to recycle all the User Guides you toss out! 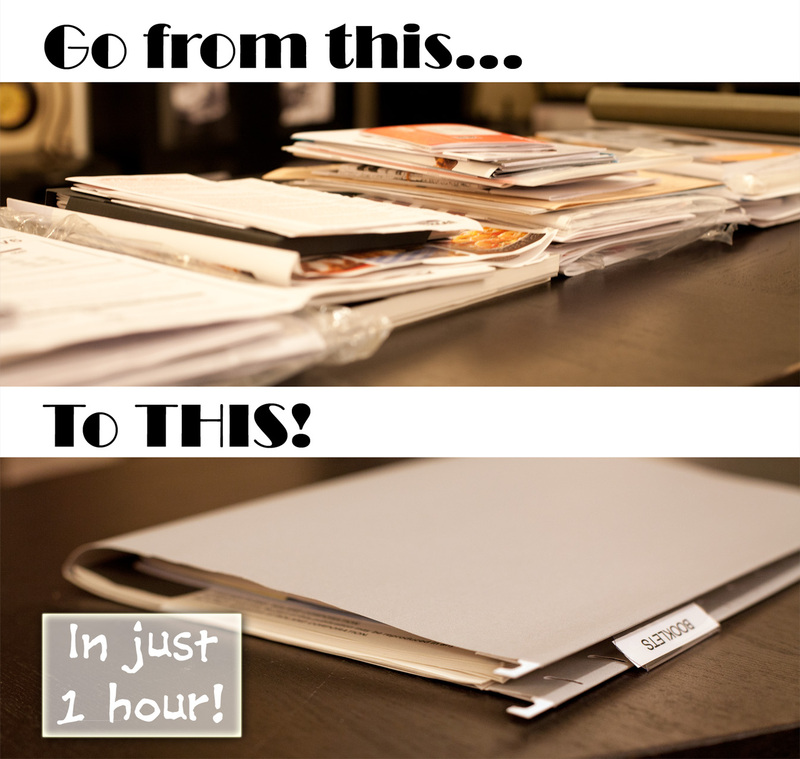 You should now be able to fit the small handful of hard-copy User Guides you decided to keep in just 1 hanging folder! Furthermore, if/when you ever need to reference one, finding it on your computer will be SO much easier than sifting through dozens and dozens of booklets in folders and drawers all over the house!! !